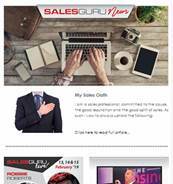 Every month, SALESGURU NEWS brings exclusive insight into the best sales minds in South Africa, completely FREE OF CHARGE! 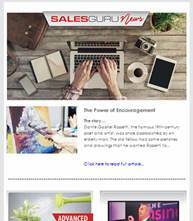 SALESGURU NEWS delivers top-notch sales articles, sales tips and the video of the month directly to your inbox. 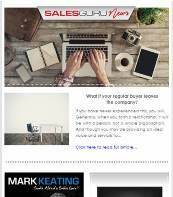 Easy to read and entertaining, it provides you with the monthly boost every sales person needs. Subscribe today! 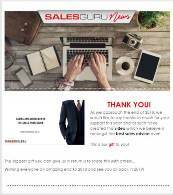 If you would like to subscribe your team members, please send a list of their names and email addresses to info@salesguru.co.za and we’ll get them loaded. Please note that we will never share your details with a third party. 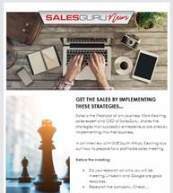 SALESFUEL - February 2019 "Get the sale by implementing these strategies..."
SALESFUEL - January 2019 "Buyers don't care!" 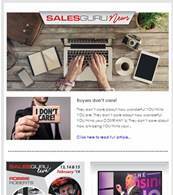 SALESFUEL - November 2018 "The one sales video you MUST SEE this year!" 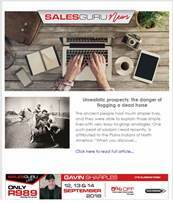 SALESFUEL - October 2018 "My sales oath"
SALESFUEL - September 2018 "The Power of Encouragement"
SALESFUEL - August 2018 "Unrealistic prospects: the danger of flogging a dead horse"
SALESFUEL - July 2018 "What if your regular buyer leaves the company?" 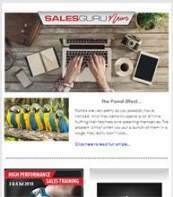 SALESFUEL - June 2018 "The parrot effect..."